Born in Munich of Danish parents, Walter Sickert came to England as a child in 1868. Taught by Whistler and inspired by Degas, whom he knew, he became one of the most influential and prolific British painters of his period. Experimenting with late impressionist and post-impressionist idioms, Sickert forged a personal practice devoted almost entirely to depictions of metropolitan life, some of them squalid. He settled permanently in London in 1905, from which time his studio served as a nerve-centre for the younger 'realist' painters of the Camden Town Group. Sickert's love of urban types, bohemia and the world of variety theatre is apparent in this atmospheric canvas. Katie Lawrence was a knockabout songstress who frequently headlined at Gatti's venue. 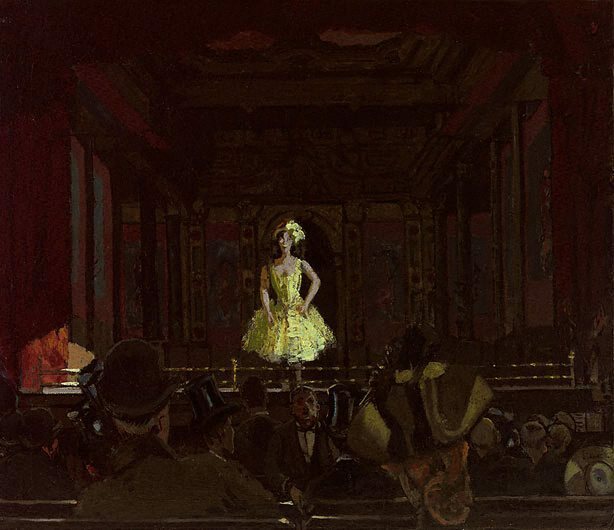 Despite Sickert's interest in working-class themes his art is far from populist, appealing as it does to sophisticated taste. Daringly, the painter portrays Lawrence as little more than a footlit smudge. Signed l.r., black oil "Sickert". Not dated. Renée Free, Art Gallery of New South Wales handbook , 'European', pg. 36-56, Sydney, 1988, 55. Renée Free, AGNSW Collections , 'The Western Heritage, Renaissance to Twentieth Century', pg. 108-172, Sydney, 1994, 158 (colour illus. ), 159. Robert Haines, Art Gallery of New South Wales Quarterley , 'Walter Richard Sickert 1860-1942', pg.423-7, Sydney, Oct 1968, 426, 427 (illus. ), 231-232. Bruce James, Art Gallery of New South Wales handbook , 'Western Collection: Paintings and Sculpture', pg. 17-77, Sydney, 1999, 50 (colour illus.). Art Gallery of New South Wales picturebook , Sydney, 1972, 40 (colour illus.). Epstein and Sickert , Brisbane, 1954. London Portrait of a City , 'The Hub of Empire 1850-1900', pg. 199-224, London, 1998, 221 (colour illus.). Marie LLoyd: Queen of the Music-halls , London, 1990, cover (colour illus.). Art Gallery of New South Wales catalogue of British paintings , Sydney, 1987, 174 (illus. ).